It’s not a concert…it’s a party! Spend a nostalgic evening saluting 3 of the world's most beloved musical groups who were instrumental in creating the Rock & Roll/Doo Wop sound: Cornell Gunter’s Coasters (“Charlie Brown,” “Yakety Yak,” “Poison Ivy”); The Platters featuring 4 of America’s premier singers performing their greatest hits (“Only You,” “Smoke Gets In Your Eyes,” “The Great Pretender”); and The Drifters, one of Rock & Roll’s founding vocal groups touring the U.S. again under the auspices of their original management team with their 50 year catalog of hits (“Under the Boardwalk,” “Up on the Roof,” “This Magic Moment,” and “On Broadway”). Combined, these three Rock & Roll Hall of Fame groups have been associated with well over forty of the top classic songs in Rock & Roll history. From “Under the Boardwalk” to “Only You” to “Yakety Yak”, very few artists can boast of a richer musical resume. 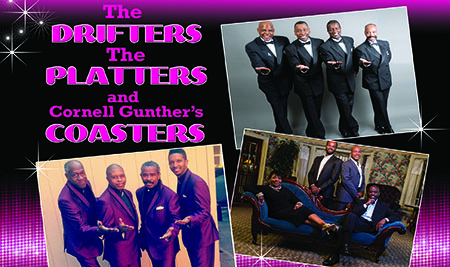 With such incredible musical diversity - from the comedy of Cornell Gunter’s Coasters to the romance of The Platters to the Motown Magic of The Drifters - this show has songs to please every palate, delivered just the way you remember them, when you first heard them on the radio.